Receive an immediate email notification with the Caller ID information and an attached .wav file so you can listen to your Alpine voicemail on your smartphone, tablet, or anywhere you receive email. 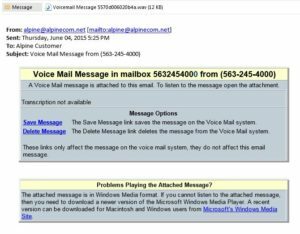 Save important voice mail messages on your computer. Best of all, Alpine Voicemail to Email can be added at no cost if you are a current Alpine Voicemail subscriber. It’s simple to add Voicemail to Email to your current Alpine voicemail service! Please contact Alpine Customer Service at 563-245-4000 or submit your request using the form below. 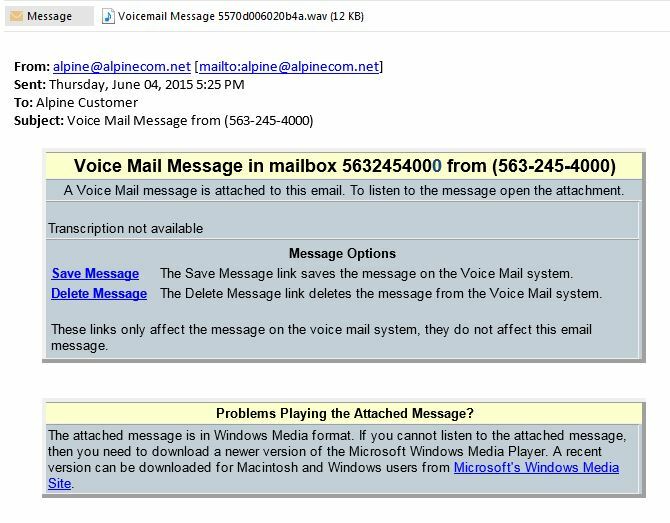 For more details on Voicemail to Email or to add Alpine voicemail service, call 563-245-4000. *Alpine voicemail service required to use the Voicemail to Email feature.